Last week I asked some key members of our team to come to our office for a semi-annual review and reflection session. For some, this required several hours driving, while others had to fly several hours. With July 4th being on a Tuesday, the latter part of the week was an ideal time to set a plan for the second half of the year. Given we only had a day and a half to identify, prioritize, and commit to a select number of initiatives – every minute was crucial, so we ordered lunch in. We decided on Jimmy Johns and one of our team members called in and picked up our order. As promised, the food was prepared “freakishly fast” and ready when our team member arrived at their store. While I could associate the response rate to prospecting and client service, it was what happened later that afternoon that highlighted the best lesson on client retention. After a good, fresh lunch, we continued working on our 2017 initiatives, including: refreshed and streamlined coaching programs for new to business agents, high impact prospecting programs for mid-career professionals, integrated personal coaching programs for mid-career and top producers, and even an ultra-exclusive live event in November. It was during this latter part of the afternoon that our team member received a call from the Jimmy Johns store manager. He stated that he noticed we had a rather large order and wanted to be sure the quality was what we expected, and that the service we received was excellent. Our team manager relayed our overall positive experience with our lunch order. What a simple, yet high impact action. Follow up. Asking a client if they are satisfied with their experience, and ensuring that you are meeting or exceeding their expectations. Likewise, saying “thank you” to your clients for their patronage. When is the last time you made a singular purposed call to thank your clients for their trust and their business? You would be surprised how such a simple act can have such a big impact. Are your clients providing you repeat business? Do they recognize how much you appreciate them? When is the last time you spent a week just calling your clients (both past and present) simply to catch up and thank them? 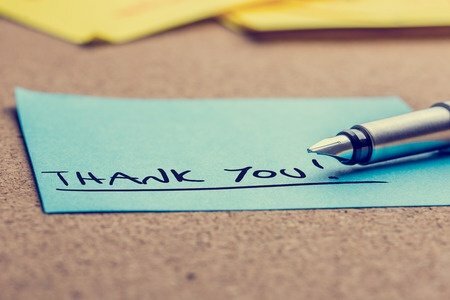 Not to ask if there is something else you can help them with, but simply to say “thank you”. Thank you for reading this post. I greatly appreciate your readership and continued trust that we will provide valuable, applicable content. If you would like to learn the 4 crucial tactics you can start using today to ensure bigger opportunities with higher quality prospects, be sure to join our upcoming webinar on July 26th at 2:00pm EST! To register for this free webinar, click here.